Well, our weather is all over the place and I've been staring at an ever-growing pile of projects, one of which has been, quite literally, underfoot (chiefly because I'm a disorganized slob) and it has been sitting around since I got it in October. 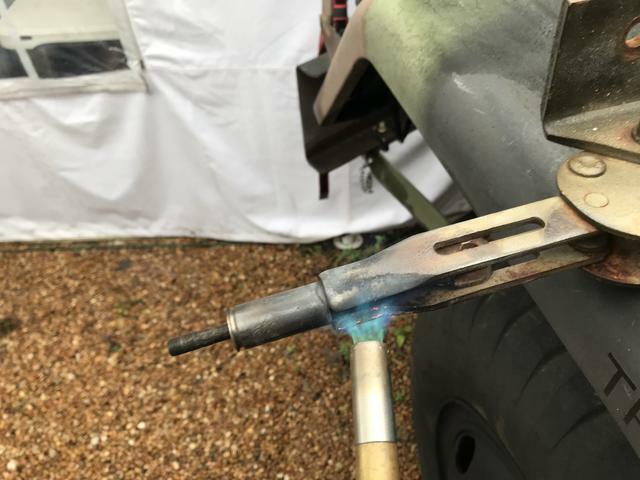 One of the saving graces of this bit was a rather generous coat of paint that sealed nearly every joint, thereby starving the active rust of oxygen and additional moisture. This is going to be a bit about technique and also meant to be a reveal, showing how these things are put together. 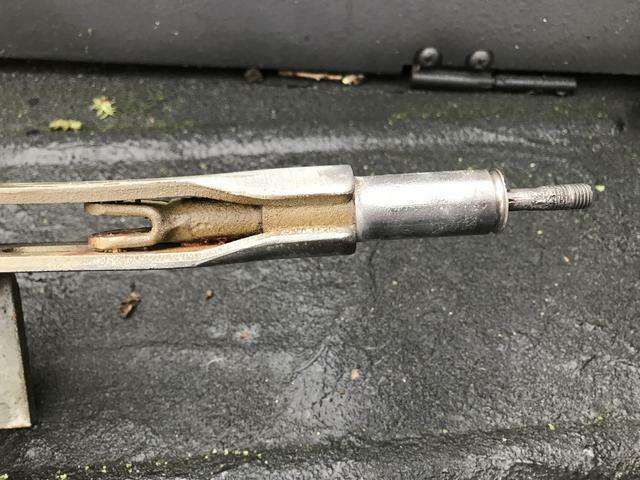 Also, the design of this particular component of the M416 hand brake lever will be very similar to that of many other handbrake levers found on M-series vehicles. 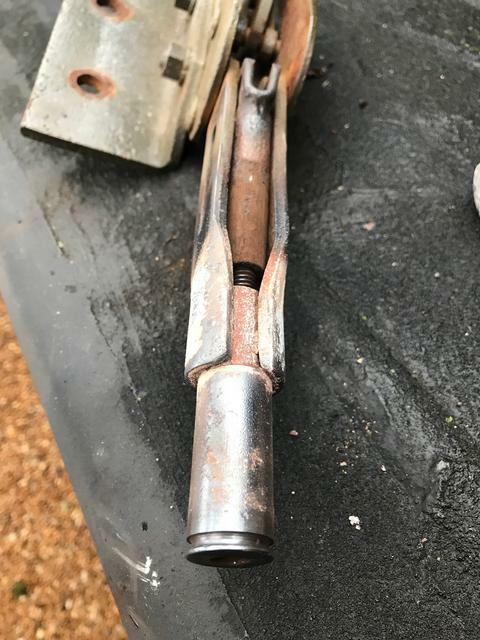 This hand brake lever/slack adjuster belongs on a later model M416A1 trailer (the big one) and it came to me as part of a trade. 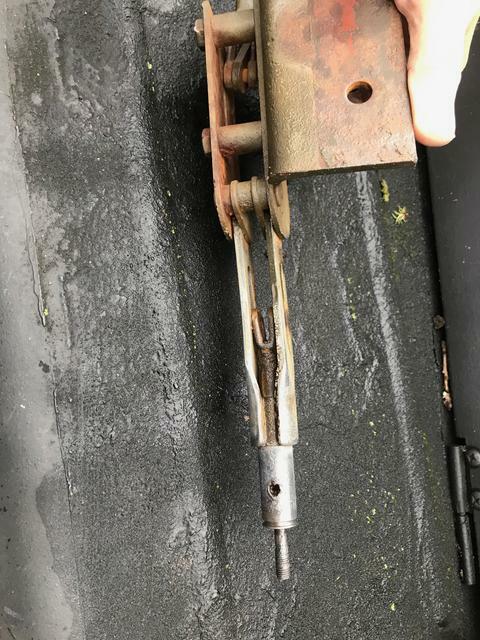 As per normal, for an item of its age and general lack of use, it was fairly well locked up and by that I mean that the slack adjuster on the lever was locked up. The lever itself moved rather well. 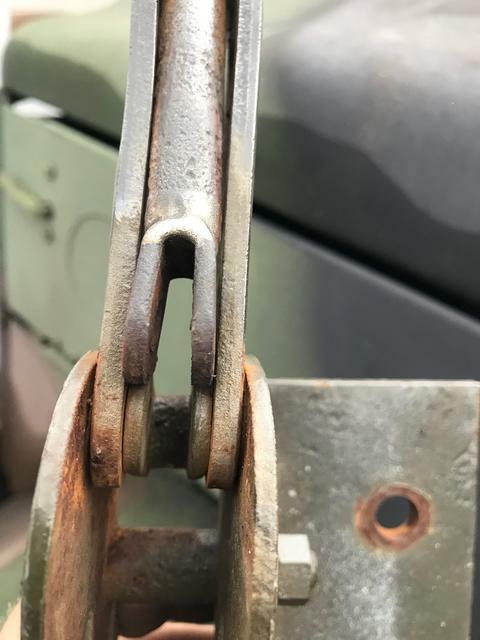 This particular component of the M416 trailer hand brake system appears to be viewed by the military not as a repairable component (though it is) but rather as a single, consumable, and replaceable item. In other words, as soon as it wouldn't work, it probably got pulled off and tossed on a pile and a new one got put on. I couldn't find much about its inner workings in the manual other than some honorable mention of it as a single piece in the diagram. Thus, its manner of assembly was something of a mystery to me. I'm sure many of our more experienced members have tread this path before and hopefully, they will have some nuggets of wisdom to add. So here we go. I began by removing the grease zerk from the neck of the assembly (it had been installed and cross threaded so it was at a rather odd angle) and with an old Xacto blade, picked away at as much debris in the hole as I could reach. I found very little caked grease within which was a strong indicator that not much had been done to maintain it. What came out was mostly powdered rust, orange in color and so, that rust was very easy to loosen up. 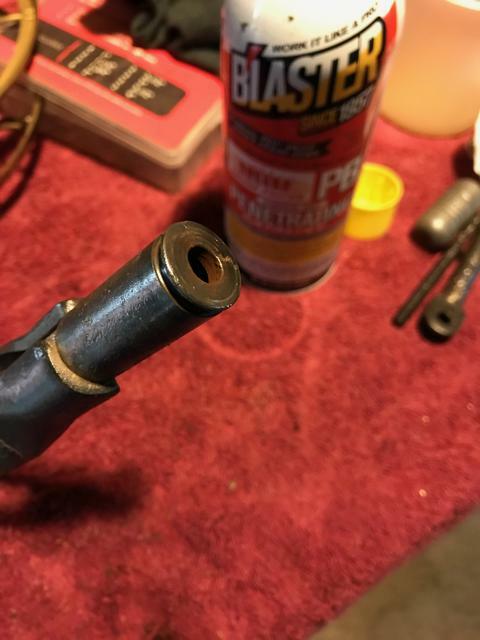 After blowing it out as best I could, I put PB Blaster into the grease zerk hole and into the narrow gap where the knurled knob drapes over the frame. I put in as much PB Blaster as it would accept and then set the whole thing up at such and angle as to let gravity help the process and walked away. While we are patiently waiting for the PB Blaster to do its duty, let's have a look at another hand brake lever. Mine is different. My knurled adjusting knob is, by all appearances, one piece. In cross section you would see that the knob has a relieved area at its base so as to form a skirt over the frame of the lever. Above that are the threads and the threaded portion is a void with a small hole at the very top center of the rounded end of the knob. Now, I have heard several explanations for that hole. I've heard most folks say its a hole for oil. I disagree but, we'll get back to that argument later. The point of these two photos is a very simple one. If you are doing this job there is a strong likelihood that you too will be unable to determine whether or not your knob is a one-piece or a two-piece component. The solution is to do your wrenching out toward the end of the knob. If it's a two-piece, obviously it will be most advantageous to remove the jam nut separately from the lower half. 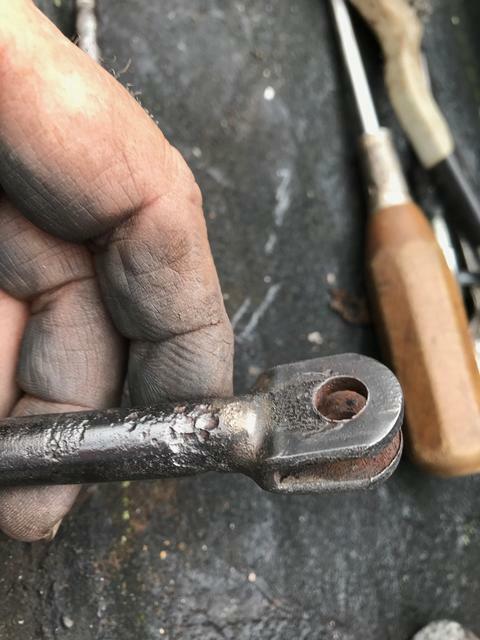 In this photo can be seen another very distinct difference between Xloflyr's brake lever and mine; one that is only visible after removing the knob. Take note that the frame of the lever assembly of his unit, through which the threaded end of the adjusting rod protrudes, is a straight tube with no relieved area where the skirt of the adjusting knob would encompass it. More on this matter in a moment. I regret that I didn't begin taking photos right away and so, my written description on the matter of removing the adjusting knob will have to do. 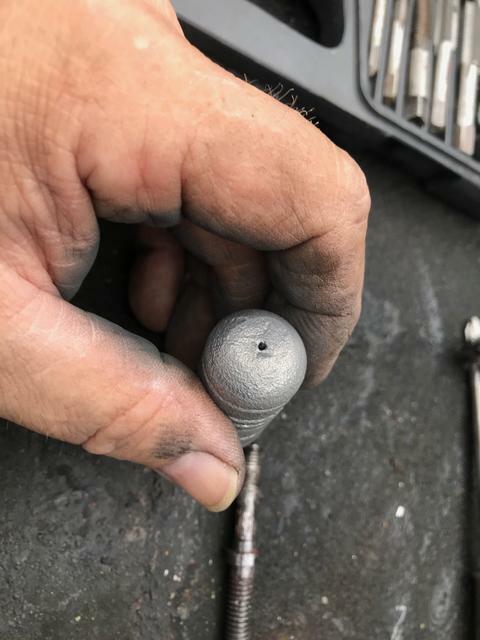 After giving the PB Blaster time to work I applied heat to the knob, which is constructed of aluminum, until it became a uniform slate gray color. 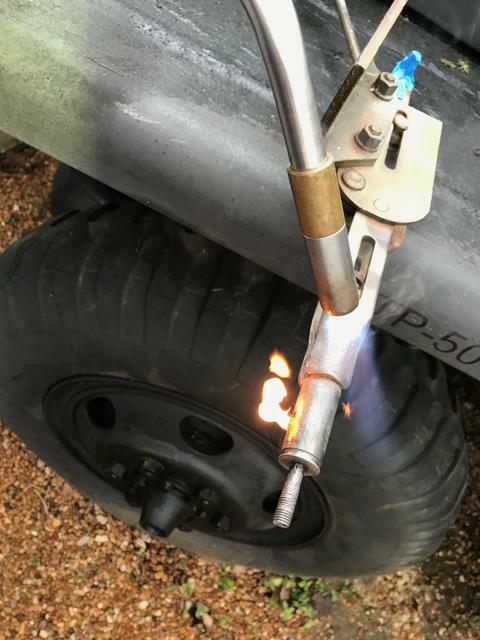 I used my trusty MAPP gas torch which is probably quite capable of melting aluminum. The slate gray color was an indicator that I was starting to oxidize the aluminum and that meant it was time to stop applying heat. 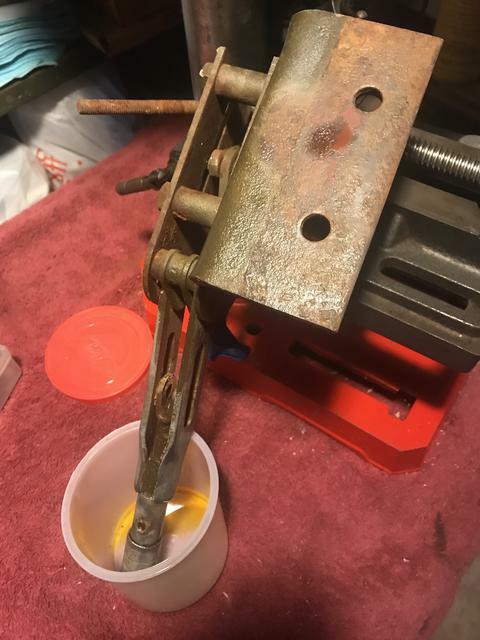 Then I let it sit for a few minutes, ensuring the heat, which I had applied to the outside of the knob was given time to penetrate all the way through the body of the knob, causing it to expand slightly and hopefully breaking the bond between the knob and the threaded adjusting rod within. Once I was satisfied I had accomplished that I shocked the knob by laying a hammer on one side while rapping the opposite side with a copper mallet. I did this through the full 360 degrees. The hammer, laid against the side directly opposite of the side where I was striking, ensured a reasonable amount of force was being applied against the piece while still providing a certain amount of give. Far better to do this than laying the piece down and beating upon one side. This is not a matter of beating the knob to death. Just enough judicious rapping to help break that threaded bond between aluminum and steel. Once it had cooled a bit more I wrapped the knurled knob with a rag and grabbed it with with channel-lock pliers. If things are inclined to move, the rag will provide enough protection to preserve the knurling. Happily, I had success straightaway. If I had not had success I would have gone back to the previous steps until I got it off. What is left is pretty ugly, eh? Blue painter's tape is there to secure a link-pin that I don't want to lose, or have to figure out where it goes later. Here, take note of the relieved area at the end of the frame. 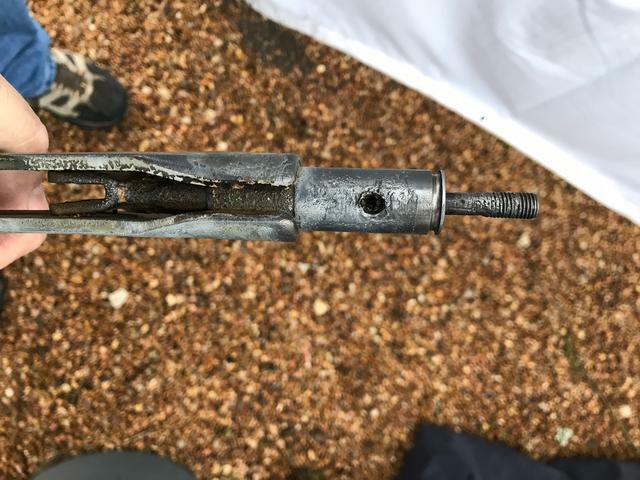 It looks almost like the end of the .50cal shell casing. 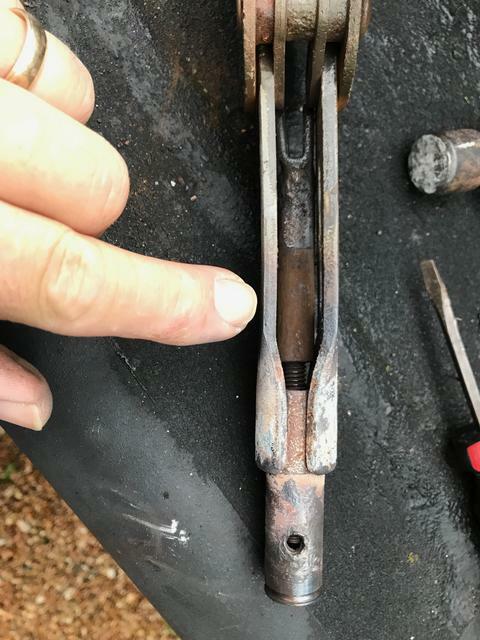 Could this groove be for an O-ring? Someone decided it was worth the additional manufacturing time to put it there. If it is not for an O-ring, the only other explanation I can gather is, perhaps it is there to interrupt any potential capillary action of water between the frame and the adjusting knob's skirt and this point is one of the most likely (and detrimental) places for moisture to enter the inner workings of the slack adjuster. 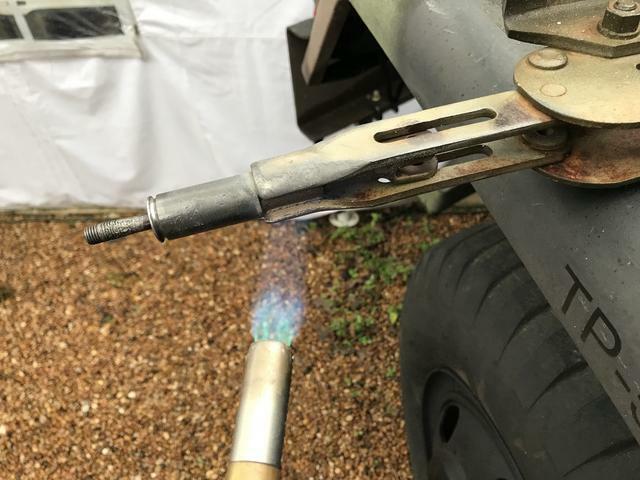 Not only do these mechanisms have the potential for getting dampened through use and exposure to the elements, they also "breath" in moist air every day through the process of heating and cooling, just as an engine or a gas tank does. And so, water condenses on the inside and, unfortunately, it never seems to find its way out. 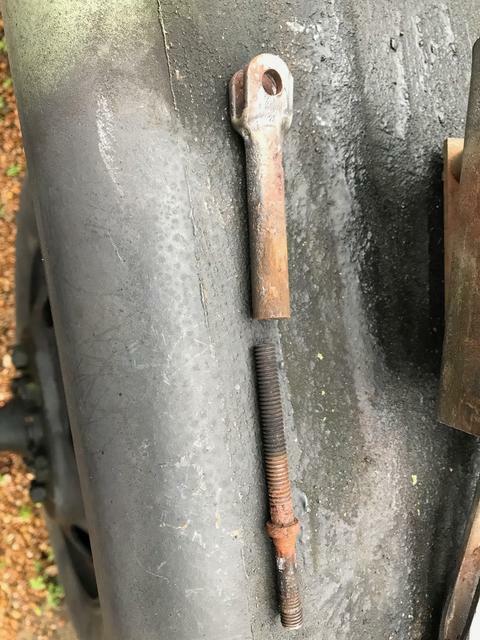 The adjusting rod is a single piece, unto itself. A very important point I want to make here is that the threaded bit you can see in this photo is NOT where the adjusting takes place. 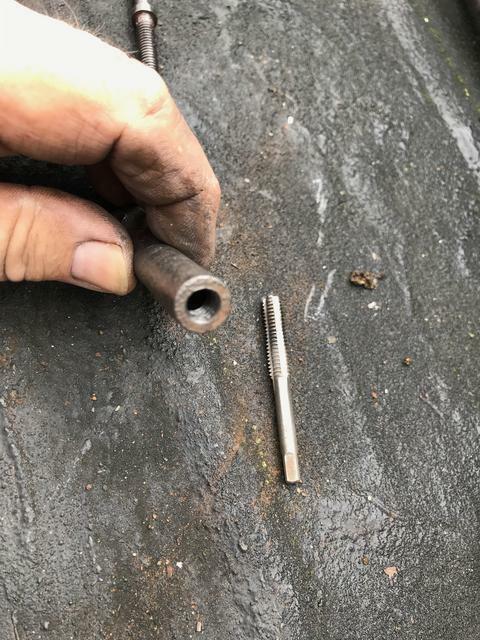 These threads are only there to attach the knurled knob to the adjusting rod. It is important to know because once the knob is on the rod it needs to remain locked up and stationary on those threads and so, the benefit of Xloflyr's two-piece jam nut style knob becomes obvious. DO NOT vigorously clean up the threads for the adjusting knob to the point where the knob spins freely. Now, at this point, the fork is frozen in the frame by rust, debris and likely as not, paint. This is the most likely area for a poorly maintained or little used parking brake lever to lock up. 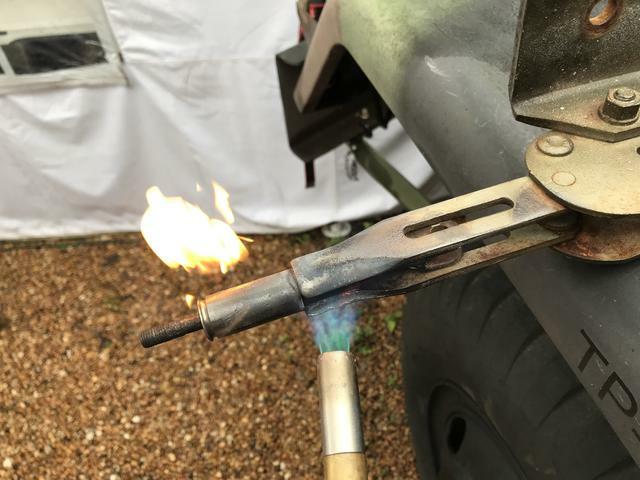 It sees the most exposure to the elements and it is the reason there is a grease zerk on the handle. Theoretically, an occasional squirt of grease will push contaminants out. It's the ounce of prevention that is worth a pound of cure. So, in order to free this up, the next step will be to apply more heat to the frame's circumference right where my index finger is. Getting mighty warm in there! As it ignites, the PB Blaster is torching out the hole for the grease zerk. Good! That means I got some PB Blaster down in there after all. Around we go, applying heat through the full 360 degrees. It was chilly this day, and humid and this piece was loving the heat. I know some of you guys are fire bugs so I will say that I did not heat this up to cherry red. Gentle persuasion and an acceptance that you might just have to do things more than once before things come apart will see this through. After rapping on the frame just as I had done with the knob, it's free. Lots of orange, powdery rust and there are the critical threads of the adjusting rod. That is precisely where the adjusting takes place in this whole assembly. But we're not done yet. 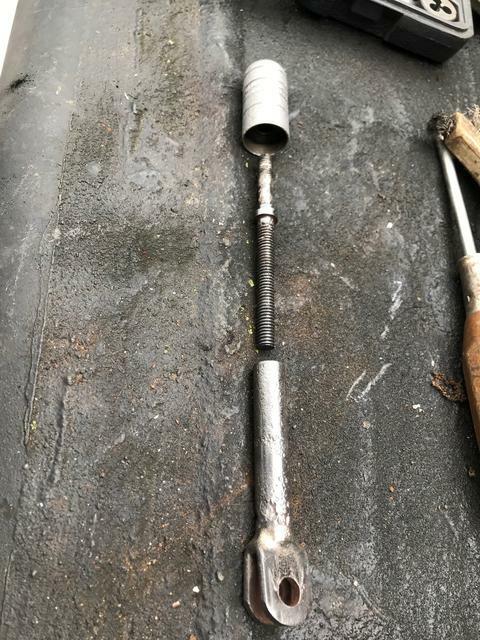 The fork cannot be removed with the adjusting rod still threaded into the fork at its current depth. It's too long and I think it's a bad idea to thread it in further. So, I remove the adjusting rod from the fork altogether. Here, we see another problem - the end of the fork is somewhat splayed outward. And yet another problem - one side of the hand brake frame is deformed; dented in ever so slightly. Both these things may need some minor adjustment. These little problems add up and can make for a balky, uncooperative adjuster. 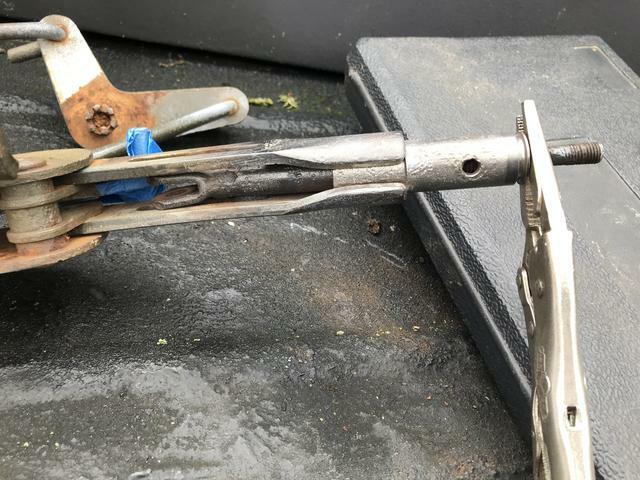 And as we know, these brake levers live outside the vehicle and they have the misfortune to be located in an area that is subject to damage, road dirt, grime and everything the rear wheels of the towing vehicle can throw at it. 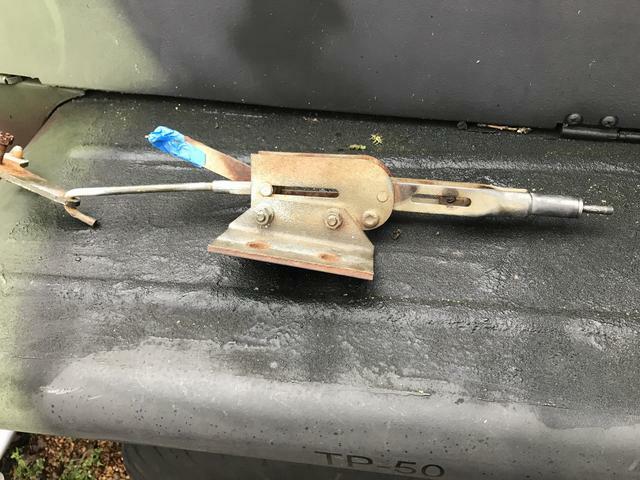 Kind of makes you want to go out and show you trailer's brake lever a little attention, doesn't it? And so, we remove the adjusting rod from the fork. Righty tighty, lefty loosey. There's a handy spot below the threads for the knob where you can get a smaller pair of vice-grips on it. Again, I have a little luck and it comes right out without much resistance but I can feel that all these threads are rather rough. That will have to be dealt with. Any plating the adjusting rod once had has long since gone and so, from this day forth, it will be at risk for rust. I cannot help but think it would benefit from a good coating a anti-seize compound during reassembly. Option two, I set up a small bath and electroplate it which is, in my opinion, more effort than it's worth. By the way, the body of the fork is not threaded all the way down. In fact, that's only about 8-10 turns at the very end. Here, we can plainly see the skirt on the knob. This skirt rides over the frame, and is very smooth on the inside; a perfect place for an O ring, accompanied by some silicone grease. And here's the knob with the mysterious hole. Still think it's there for oil? I doubt that very much because we don't want that knob loose on the threaded rod....ever. This knob, being fixed in place on its fine threads is what drives the coarse, adjusting threads in and out of the fork's body. In simple terms, the adjusting takes place only within the fork body. Be mindful of this when you are rushing to chase out the threads of the knob. It needs to be a rather tight fit to stay put. That fork looks like a veteran but is still quite strong. I will tidy up the body of the fork so that it is smooth. The same will be done with the interior of the chassis where the body of the fork normally resides. The more I look at this groove the more I am sure an O-ring goes there. This would create a perfect seal, right where it's needed. If you're in a hurry to have some O-rings on hand, Harbor Freight offers several very comprehensive Nitrile O-ring seal assortments ranging from $5-$8 (the larger kits have almost 400 pieces...more than you'll ever use) and there are many others that are probably of higher quality to be found online. So, this is as far as I've gotten with this today. Next, I'll be making these parts as good as they can be. 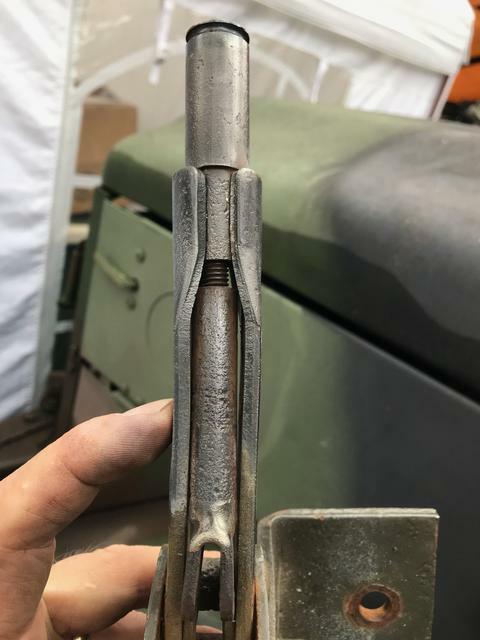 I'm sure this is going to be able to be returned to service. Yes, it would have been far easier to simply replace the unit but every penny saved is a penny that can be spent in more important places, on more important things. Obviously, this stuff will benefit from a visit to the blast cabinet before final finishing but that will have to wait until some of our heavy humidity has left us. Last edited by m3a1 on February 13th, 2019, 10:56 am, edited 19 times in total. Excellent tutorial as usual. You must have been a shop teacher in another life. Nah. I just have 'happy fingers'. 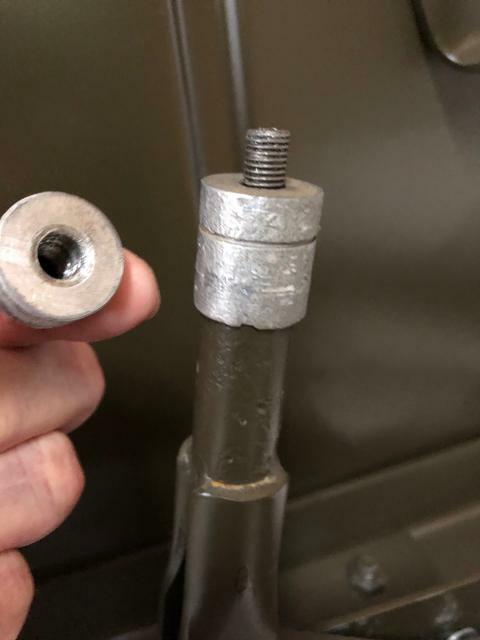 And on the matter of the O-ring I have found that an O-ring with an inner diameter of 11/16" and an outer diameter of 7/8" with a section diameter of 3/32" fits VERY well and forms a nice seal between the frame and the adjusting knob. 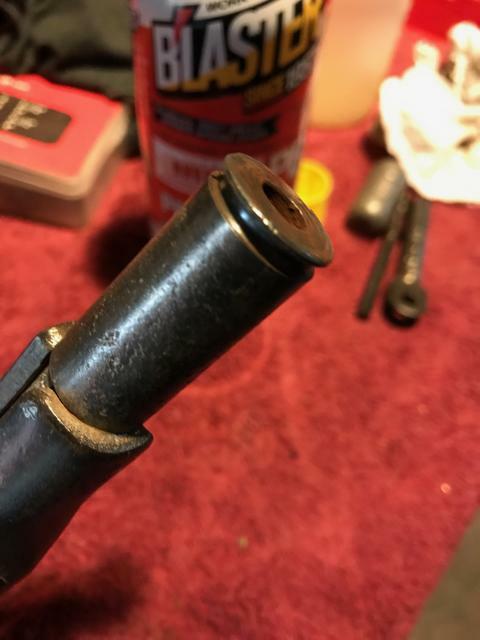 Remember this sort of thing would benefit greatly from a touch of silicone based grease to keep the seal in pristine condition and lubricated against the occasional turn of the adjusting knob.. I would also like to mention that I discovered a very thin washer (haven't cleaned it up yet, so I don't know what it's made of) that is located between the top of the frame and the base of the adjusting knob. The following is more on the tiny washer which I have concluded is a very necessary piece of this assembly. It is constructed of spring steel. It is a slightly domed washer (known as a curved spring washer or disc spring washer) so, when the unit is assembled it is located between the adjusting knob and the top face of the frame. 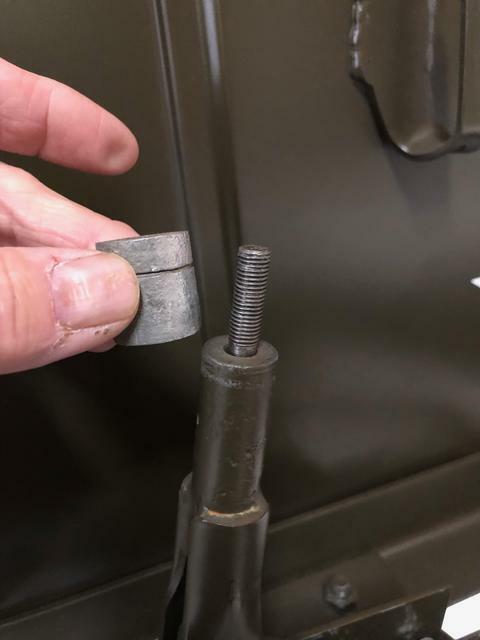 The center hole of this washer is a bit larger than the threaded rod which would allow it to compress without galling against the rod. I conclude that this washer is there to provide some tension against the adjusting knob in order to keep it from backing off from vibration. So, if you get into one of these as a project, be on the lookout for that washer, don't lose it...and don't forget to reinstall it! But, if you happen to misplace yours there are many spring washers available on the internet. 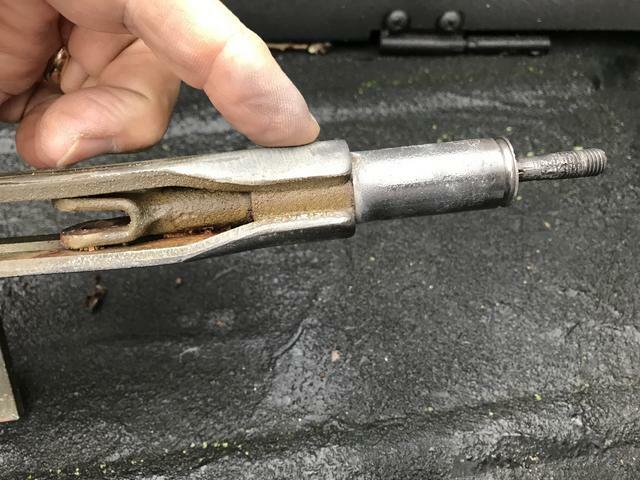 Finally, if you happen to have a hand brake that routinely wants to slack off, you don't necessarily have spend a bunch of money to replace it altogether. Take the time to see if the problem is really only a missing or damaged spring washer. Remember, every penny you save means more money to spend elsewhere.